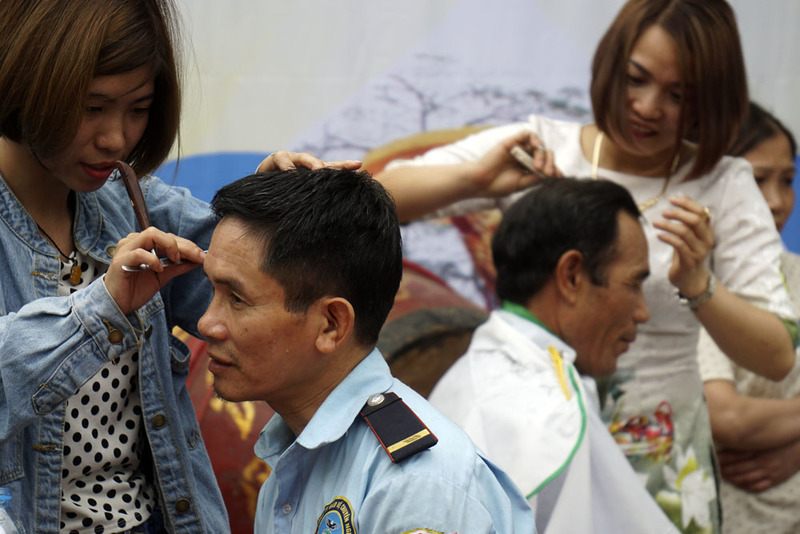 Barbers from Kim Lien Ward in Dong Da District, Hanoi and many neighbouring areas are offering free haircuts for visitors at a two-day festival to honour the ancestors of barbers on April 21 and 22. Between the 1970s and 80s, as many as 80% of the villagers were hairdressers, many of whom became famous. Although the numbers have decreased over the years but many local people have still following the trade. A number of well-known hairstylists in Vietnam have originated or learned their trade there. Hairstylist Pham Ngoc Son gave offerings to the ancestor of barbers at Kim Lien Pagoda on April 21 before joining an event to provide free haircut service for visitors. A young hairstylist gives a free haircut to a woman. There used to be a competition between hairstylists in the previous years but this year the organiser held a gala to allow them to show off their talents. Mai Thi Lan (left), who is now owner of two big hair salons in Nhon town, participated in the event. An elderly customer, Bui Huu Mai said he was very pleased with his new hair style which was given to him by a young barber. Hairstylist Phan Van Manh finishes his work for a woman.